Remembrance Sunday is a day to remember and honour those who have sacrificed themselves to secure and protect our country’s freedoms. As such, it is a date on the calendar we always celebrate at Coate Water Care, along with VE Day and the Queen’s Birthday. Behind the doors of our seven residential care homes, that usually means a tea party and the occasional stab at fancy dress – often led by one of our several staff members that have served in the British Armed Forces. But as Maureen Fossett, a home administrator at Ashbury Lodge Care Home in Swindon, relates, this year Remembrance Sunday was an extra special occasion for one particular Coate Water Care resident. Step forward former army captain Stanley ‘Max’ Blackman! 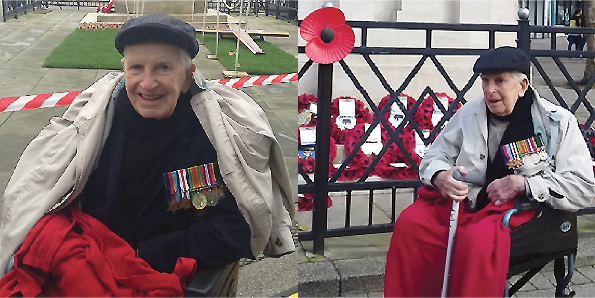 “I know how much Max likes to attend the service, so this Remembrance Day I took him to the Cenotaph in front of Swindon town hall,” says Maureen. There Max witnessed MPs, local councillors, clergymen and other dignitaries laying wreaths and bowing their heads in solemn remembrance. Veterans and cadets marched in tight formation to the uplifting sound of bugles and drums as onlookers packed the pavements along Regent Street. Please contact Tracy Ferrier on 01793 496827 to discuss your care requirements or to arrange a visit to Ashbury Lodge, an outstanding residential care home next to Coate Water Country Park.